EmployeeBook is a simple CodeIgniter based system that helps organizations manage employees. It can be used by all organizations. Some of the main features are user management, task management, role management and leave management. EmployeeBook is an efficient employee management system for organisations. Using this system you can easily manage your employees. User Manager : Provides user management functionality with ACL. 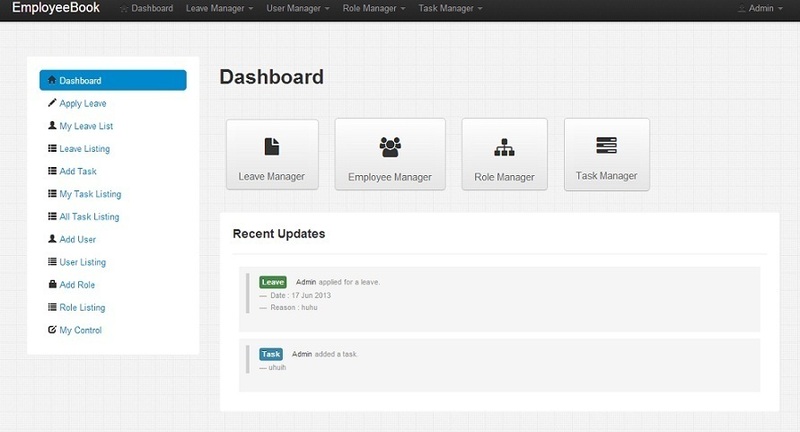 Leave Manager : Provides leave management functionality with approve/reject feature. Task Manager : Handles the daily task of employees. Role Manager : Deals with the user levels. There is an automated installation process which will install the setup at your server or your local environment. You need to just copy and paste the contents of the folder “EmployeeBook” at your hosting. This installation process will install all the necessary files and database. Next you can add your employees from the “Add Employee” section and assign their role “Employee”. Provide your employees with their username and password. Now your employees can login from the login panel and perform their tasks. Employee can apply for a leave from the “Apply Leave” section. Those added tasks and leaves can be viewed from the “Task list” and the “All leave listing” sections. Hence you can manage the progress as well as the leaves of your employees. You can also maintain a healthy competitive environment from the “Recent Updates” section. Leave management plays an important role in any successful organisation to work efficiently. EmployeeBook provides an efficient leave management interface to the organisation where employees can apply for a leave and the HR can take necessary action on the applied leave (Approve, Reject or cancel) and the employee can view the status of the applied leave instantly. Here the employee can apply for a leave by selecting the type of leave(Annual, medical..) date and submit it to the HR for review. Here the supervisor can apply for leave on behalf of team member. Email notifications are sent to the Supervisor when a leave is applied. When the supervisor Approves or Rejects a leave the the employee is sent an email regarding approval or rejection. Leave need to be allotted to the employee based on the leave types. Like 20 Annual leave alloted to some demo employee..
Leave record is maintained for each and every employee. IMPORTANT: For an employee to apply for a leave, leave have to allotted by admin or supervisor first. In this feature the Supervisors can view their team members leave. They can take necessary actions such as Approve team members leave, reject team members leave based on permissions. Supervisor can also apply for a leave on behalf of team member. This section is restricted for the HR and Admin. Here the HR gets a listing of leaves submitted by all the employees of the organisation and can take necessary action. Task manager provides an interface to the employees of the organisation for maintaining their daily tasks.They can add their daily task and at the end of the day they can edit the status of the task. The Admnistrator of the organisation can see a listing of the task added by all the employees and can trace the work progress. Here the employees can add their task by writing the title description of the task with the estimated time. Here the employees can see their task listing and take the required action on their task. Here the employee can change the status of the selected task. Here the admin can see the task of all the employees and trace the work done. This section is restricted to the Administrator for managing the employees and their details. and edit the details of any employee. From the employee listing the admin can activate/deactivate any employee and go to the edit section for editing employee details. Admin can add a new employee from this panel by providing a username, password, email, date of joining, role and supervisor. Here you can see a listing of all the employees and perform various actions such as edit particulars of the selected employee, activate/deactivate the employee and delete a particular employee. Here you can edit the particulars of any employee and change the details of the selected employee. Here you can deactivate a particular employee and that employee will not be able to login. Here you can delete the employee. In an organisation we have different levels such as Employee, HR, Manager, Admin etc. We can call these as categories within which we can distribute our organisation and every user level has its own work. We can categories our work and create as many roles as we want from the create new role panel. After creating new role we will have to decide their capabilities and assign permissions to them. Here you can edit the role name and description. Here you can provide module wise permissions to the selected role. By providing permissions theemployee falling underthose rolescan access those modules.